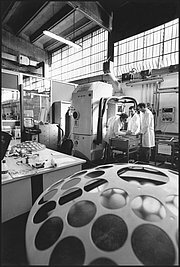 Perspex (www.perspex.com) is based in Darwen, Lancashire, UK and is one of Europe’s leading manufacturers of acrylic sheet and composites. Perspex sheets are used by customers in the display, visual communication and related industries and are sold through a distribution network including Perspex Distribution Ltd. in Great Britain, and other long established partners in Continental Europe, Africa and other regions. The Perspex product range is one of the widest in the industry and the Perspex® brand name is one of the leading global brand names for acrylic sheet products. The Perspex production facilities, product range and customer relationships will complement the existing 3A Composites acrylic sheet business based on the Crylon®, Akrylon® and Crylux™ product families with production facilities in Germany, Slovakia and Spain. Athlone Extrusions (www.athloneextrusions.ie) is based in Athlone, Ireland and is one of the leading manufacturers of coloured opaque multilayer plastic sheeting in Europe. The plastic sheets are primarily used by thermoformers who manufacture parts for the automotive industry (low series recreational, agriculture, and construction vehicles), sanitary ware industry (shower trays, bath panels), office equipment, point of sale and furniture industries. Athlone has highly developed expertise in the manufacture of complex multilayer sheets in customer specific colours which combine the advantages of consistent embedded colour, surface finish, ease of ther-moforming, light weight and recyclability. Athlone Extrusions has one of the largest scale production sites in Europe. It has a very experienced sales team with local representatives based in several European countries and a total workforce of 175 persons. In acquiring Athlone, Schweiter is strengthening the transport & industry business of the 3A Composites division, following the successful acquisition and integration of Foamalite and Polycasa. 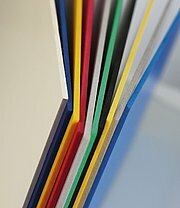 The coloured opaque multilayer materials produced by Athlone will ideally complement the existing product range of various hard and light foam materials, aluminium sandwich panels and transparent and opaque plastics sheets. The acquired business will gain strength and improved market position through access to the wider 3A Composites network of production plants and personnel across Europe. Schweiter Technologies AG has come to an agreement with the Swiss Rieter Group on the sale of all shares in the SSM Textile Machinery division. Schweiter Technologies is convinced that the sale of this business to Rieter makes good industrial sense and that it has found the right owner for the further development of the textile machinery business. With the sale of its SSM Textile Machinery division, Schweiter Technologies will be focusing wholly on the expansion and further development of its composites business (3A Composites). PNG Balsa specialises in the planting, harvesting and processing of balsa wood used primarily as a core support material within wind power turbine blades and for the marine market. 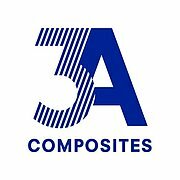 With this acquisition, 3A Composites is further strengthening its leadership position in the core material business and is securing its future supply of balsa wood for the wind power industry and new areas of application. With the previously communicated investment in a state-of-the-art balsa wood processing plant in Ecuador, this acquisition of PNG Balsa reinforces the strategy of focusing on innovative, high-quality balsa and PET products in the lightweight construction field. Polycasa is one of the largest manufacturers of transparent plastic sheeting in Europe. The materials are widely used in the fields of advertising, communication and industry. Polycasa offers a wide range of plastic sheet products with different structures, coatings, thicknesses and degrees of translucence and uses a number of different materials ranging from acrylic through polycarbonate and polyester to styrenics. Polycasa has five production sites in Europe that meet the highest quality standards and which, together with its unique logistics concept, offer customers the widest possible range and maximum availability. In acquiring Polycasa, Schweiter is strengthening the display business of the 3A Composites division, following the successful integration of Foamalite. The transparent materials produced by Polycasa will ideally supplement the existing product range of various hard and light foam materials plus aluminium sandwich panels. In many areas, Polycasa uses similar technologies to those used by 3A Composites. Joint innovation efforts will generate potential for growth and open up new business areas. This means that the company can continue to expand its market position both in its existing business through 3A Composites and in the new areas via Polycasa. Plastwag is a medium-sized Polish company which manufactures high-quality fiber-reinforced and thermoformed plastic components for the mass transportation sector. The company is located in Mielec, one of Poland’s largest special economic zones. In acquiring Plastwag, 3A Composites is significantly strengthening its activities in the area of functionally integrated lightweight systems for energy-efficient buses and rolling stock. Centrally situated between Western and Eastern Europe, Plastwag is ideally positioned to serve the major plants of existing and new customers in Poland and neighboring countries. The acquisition will add new production technology offerings to the current product portfolio, marking an important step in the direction of system supplier. The Plastwag plant’s modern infrastructure and attractive location will increase the 3A Composites division’s competitive leverage in the transportation business over the long term. Foamalite Ltd. in Loch Gowna, Ireland, produces and sells PVC foam sheets and PET plastic sheets, serving segments throughout the entire European market. This acquisition will enable 3A Composites to further build on its lead role in Europe’s foam sheet market and at the same time augment its product range with transparent plastic sheets. The market-leading PET-based products manufactured by Foamalite enjoy considerable growth potential thanks to the superior material properties of PET. The Giudici company is the leader in false-twist texturizing technology, a system for processing ultra-fine nylon yarn and similar materials. Giudici’s yarn texturizing technology will augment SSM Textile Machinery’s existing air texturizing know-how, securing the company’s already strong position in the chemical fiber processing industry. 3A Composites, previously known as Alusuisse Composites and, since 2001, as Alcan Composites, is a group of companies specializing in the development, manufacture and marketing of modern technologies and in the transformation of raw materials such as aluminium, paper, plastics and balsa wood into unique light-weight solutions such as aluminium sandwich panels, foamed plastic panels, foam boards and flexible foam and core materials. 3A Composites is the world market leader in most of the markets it serves. The group offers a large number of sector-leading brands in the areas of signage and graphics, facade design, wind power, marine and other transportation markets (such as rail and road-based public transportation), automotive and other industrial segments, as well as in the healthcare and wellness markets. Within the Schweiter portfolio, 3A Composites – as a supplier of consumer-type capital goods – will balance out the cycles of the two existing divisions and any possible further acquisitions in the engineering sector. Schweiter Technologies has reached an agreement with the French Group Essilor International for the sale of all the shares in Satisloh Holding AG. The acquisition of Satisloh by Essilor means that the research & development capacities and know-how of the two companies can be used even more effectively, resulting in particular in shorter innovation cycles. This will benefit the entire optics industry, from laboratories and chain stores to individual opticians. Schweiter Technologies is selling its Ismeca Automation division to the Dierikon-based Komax Group (Switzerland). Following the sale of Ismeca Automation, operations at Schweiter Technologies will focus entirely on machine construction in the textiles, semiconductors and optics sectors. An agreement with LOH’s family shareholders on the acquisition of all company shares was signed to take effect as of 1 November 2004. The merger with Schweiter Technologies’ Satis Vacuum division will create an all-in provider for the treatment of spectacle lenses with a world market share of over 60%. The aim is to supply the market with a sustainable offering ensured by full sales and service coverage and by superior, customer-led technical solutions. This includes process integration wherever a productivity thrust is expected. For customers the move will mean considerably simpler procedures and more productive applications. 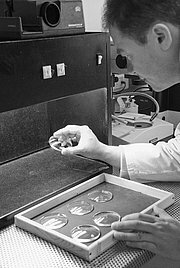 With retroactive effect from 1 January 1999, Schweiter acquires the entirety of the shares in Stähle-Eltex GmbH, a company headquartered in Reutlingen, Germany. The acquisition of Stähle-Eltex can be seen as rounding off the group’s range of business activities in the air texturing field. By acquiring Stähle-Eltex, the group strengthens an existing successful partnership and proactively builds on its position in the promising texturing machinery market. Schweiter Technologies acquires the assets of the winding technology division of Sucker-Müller-Hacoba GmbH, Mönchengladbach (SMH), a subsidiary of Babcock-Borsig AG, Oberhausen. It integrates this business into the newly founded company HACOBA Spultechnik GmbH, headquartered in Wuppertal. HACOBA is the world market leader in the area of Sewing Thread Finish Winding and special winding machines for textiles, wire and other yarns. The acquisition of HACOBA is a valuable and highly complementary addition to the winding technology portfolio of Schweiter Technologies’ textile machinery business. Establishment of Schweiter Technologies as a holding company. Jean Schweiter and his company win the recognition of the textile world with his invention of the horizontal spindle replacing. Jean Schweiter takes over the workshop and runs it as an engineering factory. Jean Schweiter and Heinrich Schrader build one of the first mechanical pirn winders in their repair workshop.